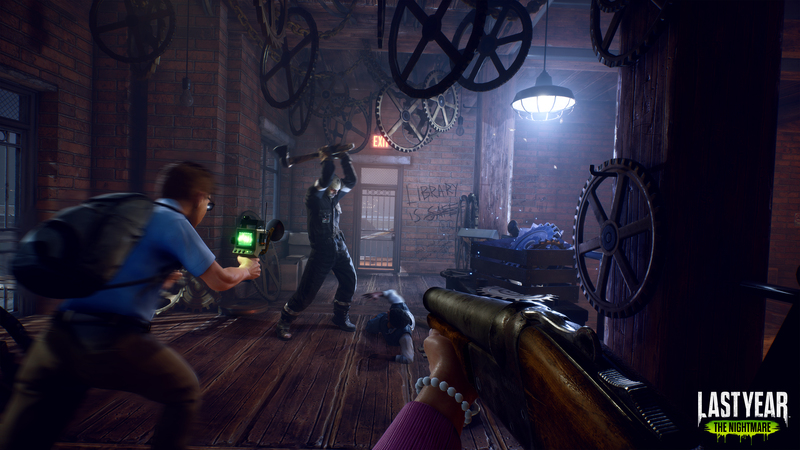 Last Year: The Nightmare is a six-player online horror survival game that puts you in the shoes of your usual high school archetypes, from the mean girl to the social outcast. When the five schoolmates wake, they find themselves in a perverse version of the Breakfast Club with their campus filled with death traps and a psycho killer hot on your heels. The premise for each game is the same, the murderees need to find a way to escape which usually involves finding some key set of equipment in order to open a limited timed gate to escape the level with your heads still intact. Picking scrap left around for you and your gang to upgrade your gear in a deliciously 90s aesthetic will be vital to that end. At the start of each match you can choose from one of the following classes; Medic, Assault, Technician, and Scout. Early on, you’re easy marks for one of the three killers who plan on making your lives hell in the early game. The teens can craft numerous goodies with the scrap left around the stage to upgrade their equipment and skills. Depending on the stage and the team composition, your upgrade path may change. A technician can boost up their nail gun turrets whereas a Scout can go for crafting a shotgun instead of spending scrap on focusing on improving their scanner to blind Killers and spot traps. Each killer in Last Year: The Nightmare is inspired by classic supernatural movie Slashers. As a Killer, your best course of action is divide and conquer. You’ve got the Strangler, crazy fast killer with hook chain that pulls victims towards him. The Giant can ram through walls and can pick up people and toss them at record distances. Finally, you’ve got the Slasher, an ax-wielding who works as your more balanced choice. During the match, the player who’s the killer can switch between the three everytime they die. When a teen gets killed they need to sit out the match for a bit before respawning. In order to respawn, your teammates need to rescue you from a locked room. If you take too long you may end up with no one left to complete any objectives and it’s game over. At first, Killers are crazy overpowered and can make insanely short work of the teens, especially when one separates from the flock. Thankfully, Predator mode it what gives Killers an edge giving them an omnipresent look at the playfield. Here, you can lay bear traps, booty trap scrap caches with poison gas, choose a spawn point almost anywhere on the map. What I like about this mode is that it replicates that moment in horror movies where it feels like the Killer can just appear when he wants as if cheating the system. It’s a great feeling when you time a spawn right when an unsuspecting victim is caught. A skilled Killer can make hit and run attacks and force your team to split. The match flow can vary a lot depending on how well the teenagers work as a team. As a Discord-exclusive first, there really isn’t a reason why you shouldn’t be talking to your team when playing Last Year: The Nightmare. A good squad will work, not hog resources and find creative ways to lure an overzealous Killer into a beatdown. I’ve been in matches where we’ve completely ambushed the Killer with an awesome combo of hitting him a taser, then blinding him with a scanner then hit him again with melee attacks and nail gun turrets. Killers like the Giant are bullet sponges who can be easily outmaneuvered around because of his cartoonish build. It’s hilarious to see a massive serial killer losing his mind because a group of teenagers are literally running circles around him, smartly managing the cooldowns on their abilities. Killing Killers buys the group a long enough window to nail down the stage objectives like hacking computers or refueling lifts. The objectives in each stage never change, so as a Killer you eventually get a better sense of where you can leave traps or crash through a vent or skylight for a dramatic one-hit kill. Killers can often use their own deaths to get into a better position to get their revenge. There’s not much in terms of progression yet in the game. When you escape or kill a bunch of teens, you’re rewarded with some trophies that tally a score on the leaderboard. There are no new player skins or cosmetic upgrades. There’s nothing to work towards if you’re looking for an incentive to keep playing other than sheer fun. With only a couple of stages currently available, it’s easy to quickly feel like you saw everything you need to see out of the Last Year: The Nightmare. When compared with games like Friday The 13th it definitely feels more polished and focused, though, with its simple and clear objectives. 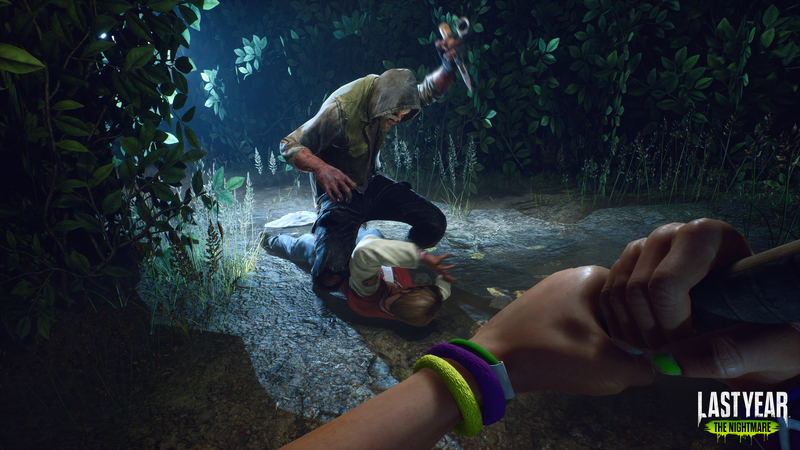 The game is very balanced with a lot of matches see-sawing between Killers and Teenagers. I also ran into a number of connection issues where people stood in place for about a minute only to die when a connection was restored. Review code provided by the publisher. You can purchase the game via Discord Store.